Over the last few years, I've fallen in love with BB/CC Creams, Tinted Moisturizers and Blurring products. But I've just been introduced to a new foundation from Dolce + Gabbana which has taken me to a new place - powder. And I'm not going to turn back any time soon. 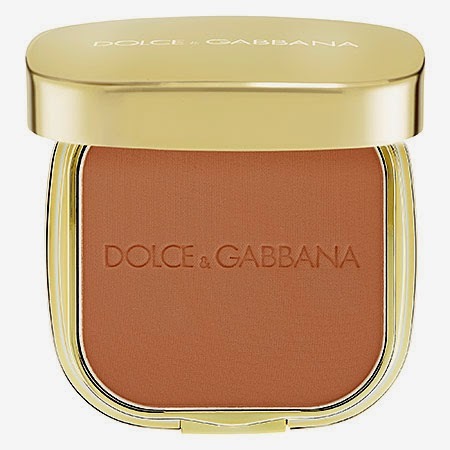 Dolce + Gabbana The Foundation Perfect Finish Powder Foundation has a unique and luxe formula which worked beautifully on my combination skin to provide the perfect combination of coverage, glow and mattifying. I used the foundation in shade Sable 160 (there are 15 shades in all), for a very good color match. Most of the time I used it dry with either a foundation brush (or the included soft sponge in the bottom chamber of the compact). The silky, finely milled powder glided almost like a liquid/gel on my skin. The coverage provided instant evening of my skin tone, and in my more oily areas, a nice, natural (not cakey!) matte effect. This was quite impressive. Also, while it was a powder, I noticed it also had a bit of a "glowifying" effect on areas like my cheeks. This foundation can also be used with a damp cosmetic sponge to create more of a dewy look and for more thorough coverage if needed. I usually only needed a touch of concealer under the eyes before using because of the coverage, but it can certainly provide enough on it's own if that's all you need. I also loved the long lasting wear using it this way as well. The powder felt imperceptible on my skin and during the day the wear was flawless. There was no drying, flaking or making my drier areas look more dry. As for my t-zone, I barely had to blot during the day the oil control was so great. The effect made me look polished and put together no matter if it was 9 am or 9 pm. *This product was provided courtesy of Dolce + Gabbana PR for reviewing purposes.